What things could people do for you on a really bad day that would really help you?—My mind draws a blank on this one at this time. If you could make a 15 second speech to the entire world, what would you say?—Be A Blessing to someone. Would you rather be an amazing dancer or an amazing singer?—My answer is an amazing dancer. I love dancing. Bonus question: What are you grateful for from last week, and what are you looking forward to in the week coming up?—A peace of mind. 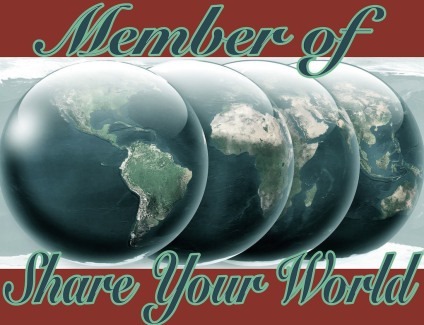 If you are interested in doing share our world, go to Share Your World – 2016 Week 18 and find out what to do, . Would that help for your bad days? Thank you I love hugs too, :). I love your answer to number 3. In being a blessing we are always somehow blessed.